I didn't think I would say it. But I am. Sometimes, I get sick of hummus. Okay chill--we all need variety. After all, variety is the spice of life! So what is a Dietitian and foodie to do? Improvise! I always seem to have a can white kidney beans (or cannellini beans) in my pantry so I opted to use this as inspiration to create a protein based dip. 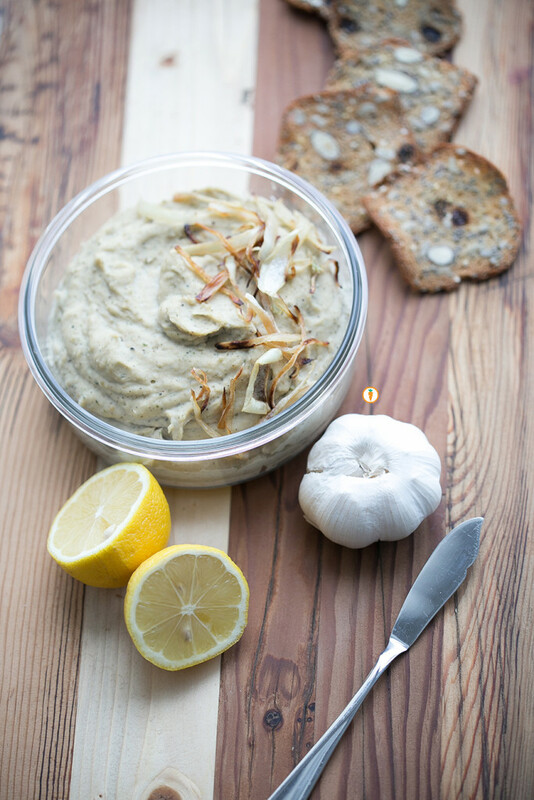 Because the cannellini bean is more pastey the result is a thick and spreadable dip. I prefer to dunk veggies and crackers into this pretty stuff but I've also added dollops of it onto salads. This recipe is totally versatile. You can add more or less of any ingredient or even nix something you don't like. For example, my sister isn't the biggest fan of caramelized onions, but I love them. They make for a beautiful garnish and give it a sweet flavour. Love! Give it a try and let us know what you think! Taste and add more spices as needed. Feel to also add 1 tbsp of water at a time to reach a desired consistency. Garnish as you wish! You can garnish with caramelized onions, olives, herbs or a drizzle of olive oil!